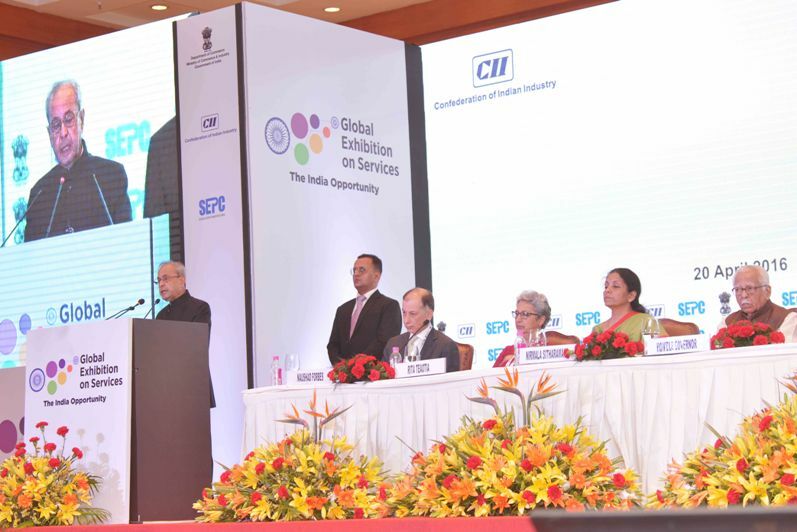 01.I am pleased to be amidst you today to inaugurate the second Global Exhibition on Services. At the outset, let me compliment the Department of Commerce for organizing this unique and far-sighted event in collaboration with the Confederation of Indian Industry and the Services Export Promotion Council. It is heartening to note that delegates from all service sectors and twelve foreign countries are participating in this event. To my mind, this is an important platform for the Indian services industry, especially in view of the growing relevance and importance of the Services Sector. 02.The services sector today has emerged as an agent of change for the country. This sector drives the Indian economy in an inclusive and equitable manner. It is the ‘sector of the current millennium’, in terms of generating employment, skill development, bringing in FDI, enhancing trade and boosting strategic partnerships. 03.India has the one of fastest growing service sector in the world with annual growth rate of above 9% since 2001. The contribution of service Sector of India to overall GDP has increased sharply, from 41% in 1990–91 to 66% in 2014–15. The dynamism exhibited by India’s service sector is largely a reflection of the liberalization and reform process carried out in this sector since the 1990s. There exists a positive correlation between the extent of liberalization and growth in different service subsectors in India. The services that have been liberalized the most in terms of trade and FDI policies have experienced higher growth rates and employment creation opportunities. 04.The share of India’s services exports as percentage of the global services exports at about 3.2 percent is nearly double that of its share of merchandise exports in global merchandise exports. India is currently the eighth largest exporter of services in the world. In 2014-15, India’s Services exports stood at US dollar 158 billion as against services imports of US dollar 81 billion. India’s services trade surplus cover about 53 percent of the deficit in merchandise trade. 05.The services sector encapsulates many areas such as IT, Telecommunication, Finance, Logistics, Professional Services, Entertainment, Education, Tourism & Hospitality, Retail, and Healthcare. In fact, it includes all sectors, which contribute to the well being of a citizen. We enjoy natural advantages when it comes to services sector due to our beneficial demographic profile. For India, thus, services sector will remain the key driver of economic growth. 06.Services are increasingly embedded in manufacturing and infrastructure. Economies round the globe depend greatly on their attainments in sectors such as IT, creativity and innovation, design, R&D and professional services. India’s famed IT industry has demonstrated the capabilities and potential inherent in the Indian services sector. The IT sector has positioned India globally as a major services hub, becoming a major exporter of IT, BPO and software services. With over 4,300 technology start-ups in the country, India has emerged as the third largest start-up eco-system in the world. The IT sector has become a true success story for the Indian services sector. We need to replicate this success across multiple sectors. 07.Service Sector of India has been one of the biggest sources of employment generation. The share of employment in services sector in 2011-12 was 28.5 per cent which was 4 per cent higher than that in the industry sector. The exponential growth of service sector have opened tremendous job opportunities in the software development; information technology; BPO Services; financial institutions; telecommunications; internet service; aviation industry; tourism and hospitality industry. In the years to come, the service sector will be one the largest generator of employment opportunities in India. 08.Tourism and hospitality sectors of India have a lot to offer to the world and could become a potential game changer for service sector. To promote tourism and hospitality industry, a safe and secure environment for the domestic and foreign tourists has to be ensured. The theme of ‘Atithi Devo Bhava’ has to be applied in letter and spirit to bring about attitudinal change. The "Swachch Bharat’ initiative of the government resonates well with our aspirations to make India a neat and clean destination for tourists. 09.India is fast emerging as a premier destination for medical tourism. The parameters that work to India’s advantage include its low-cost, world-class medical, diagnostic and wellness services and infrastructure. To realize their full potential, the tourism and hospitality industries need consistent support of policy initiatives and development of requisite infrastructure. It is true of other service industries as well. 10.The service sector of India has the potential to lay the path of India to migrate from a developing to a developed economy. It is, therefore, important to design and implement a services-driven development strategy within a coherent and comprehensive policy framework to ensure linkages with key policy areas and overall national development objectives. 11.The process of liberalization started in 1990’s in the service sector has to be strongly pursued with major policy initiatives and subsector focused approach. The results of service sector post initial era of liberalization warrant that the process of reforms and liberalization has to be further intensified to fully utilize its full potential . 12.The ‘Make in India’ initiative of the government is a comprehensive and unprecedented overhaul of outdated processes and policies. It represents a complete change of the Government mindset – a shift from being an issuing authority to becoming a business partner with the basic tenet of ‘Minimum Government, Maximum Governance’. To transform the entire ecosystem of public services through the use of information technology, the government has launched the‘Digital India’ programme.It has been envisaged to transform India into a digitally empowered society and knowledge economy.With these policy initiatives, the entrepreneurial skills and business initiatives of the manufacturing and service industry has to converge to instill a sustainable and robust growth of the economy. 13.When India is embarking upon a mission to become a world leader in manufacturing and service sector, we have to generate skilled work force to cater to domestic and global job market. The ‘Skill India’initiative of the government is aimed at training over 40 crore people in India in different skills by 2022.The initiatives include National Skill Development Mission, National Policy for Skill Development and Entrepreneurship 2015, Pradhan Mantri Kaushal Vikas Yojana (PMKVY) scheme and the Skill Loan scheme. 14.The government through its ‘Make in India’, ‘Digital India’, ‘Start up India’ and ‘Skilling India’ initiatives is bringing about business process re-engineering in its working to promote ease of doing business. It is now incumbent upon the business leaders to seize this opportunity. The synergy between government and industry can make India achieve significant socio-economic transformation. You all in the service sector have a larger responsibility on your shoulders to become co-partners in the success story of Indian economic development. 15.In this context, the Global Exhibition on Services (GES) is a much-needed forum to give a global visibility to encourage trade in services. The sector in its wide outreach can surpass geographical boundaries and unite nations through the common thread of offering skills and capabilities under its umbrella. 16.I am confident that this event shall enable the participants to discuss ways and means to position India as a global services hub and harness its vast export potential to keep the smart pace of our economy. The event is likely to give sea of opportunities to all stakeholders to articulate their ideas and draw out an action plan to make the service sector vibrant, sustainable and a driving force of our economy. 17.Let me extend my best wishes to the organizers and the participants of this important event. I hope that during the next three days, the delegates will have fruitful deliberations to discuss business initiatives; forge strategic alliances and lay a roadmap for exponential growth of the service sector of the Indian economy. Wishing you Godspeed in your endeavours!